One of our most popular personalized groomsmen knives! Give a luxury gift of streamlined design with this razor sharp, personalized stainless steel knife that will provide years of reliability. Knives are useful tools especially for the outdoor enthusiasts in your life. Each of these Stainless Steel Lock Back Knives measures 3-1/2" x 1-1/8" closed and 6" open. Handle personalized with up 2 lines of 15 characters per line. Box measures 4-1/2" x 2-3/4" x 1-1/8". 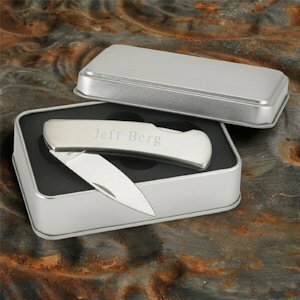 The lovely gift box make this an excellent bridal party gift for all the men including the groom, groomsmen, best man, ushers and more.